This should be interesting… Although I feel that ultimately the customers should have the biggest voice in the “revamping”; not just company mergers and partnerships. But I guess that’s why it is a test market, as they say. At my location, customers are killing themselves for quick, healthy options and I feel that the RF turkey and veggie artisan sandwiches are not too filling…. The oatmeal addition is nice, but cumbersome for baristas to make quickly. I think the food (because it’s not freshly made) is always a challenge… No one can ever be satisfied. Excited for the possible changes, but also apprehensive….the grunt of complaints get taken out on the front lines. I never tried the old breakfast sandwiched & found they looked like day old fast food breakfast, very unappetizing. 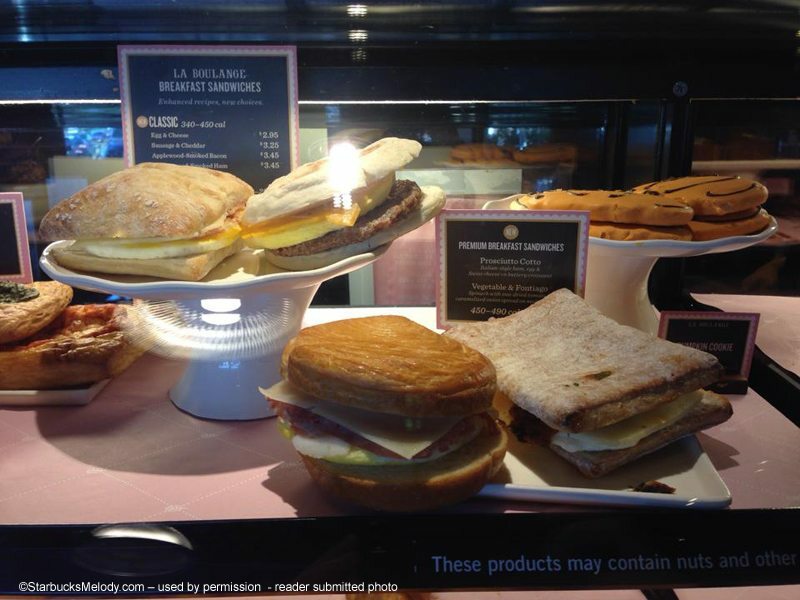 Since I absolutely hate the new La Boulange pastries I will not be trying them. I don’t think I would try one even if offered it for fee. Will the new sandwiches replace the existing sandwiches? I don’t care that much, since they’ve already discontinued my favorite, the Chicken Sausage Breakfast Wrap. More vegetarian options would be nice. I have a love hate relationship with the food options at SB. I started trying the artisan veggie breakfast sandwich and it is ok but not great. I too feel that SB has neglected the vegetarian crowd and need to pay more attention to this customer group. Also, since the new pastries are not great I am not hoping for success with the new breakfast options. I wish we had such a great variety, here in Poland. We have a choice of only 2 wraps (chicken pesto or turkey/bacon) and around 4 different ciabatta’s in these nasty plasic bags. @Purple1- I can understand the wish for more vegetarian options. While the percentage of people who are strictly vegan is tiny, the number who identify as vegetarian or just have a preference for less meat, is much higher, so I’ve heard. I’m one of those people who is not a vegetarian but loves to eat plenty of veggie foods. I lean towards vegetarian options at times. Heck, one of my all time favorite restaurant chains is the Veggie Grill. (A California company with a few restaurants in Washington). @James, the new reduced fat turkey bacon is divine! The turkey bacon is a full strip of what you would find in the grocery store and the new whole grain English muffin is leaps and bounds better than the old one which was hard/chewy. @bmommyx2, if you take a bite of something you aren’t satisfied with please ask your barista to exchange or refund you for something else! They should oblige. @Carol, they do replace the current line up. The new vegetable sandwich reminds me of both the spinach feta and the chicken sausage wrap. It has spinach, roasted tomatoes, caramelized onions, Fontiago cheese, and egg on a whole wheat wrap. @Sheri, there are now three Lacto-Ovo Vegetarian options with the new sandwiches: Spinach Feta Wrap, Vegetable and Fantiago, and Egg and Cheese on toasted multigrain bread. Finally a egg and cheese option! @Purple1, the new sandwiches are currently selling better than the old sandwiches at my store. The price of the two premium sandwiches usually causes a pained look on my customer’s face, which are the two best sandwiches in my opinion. Thanks, Melody. I love caramelized onions. 🙂 That Egg and Cheese sandwich sounds good too. @Carol, you’re welcome. Hopefully you will be able to try one soon! They are amazing. The sandwiches are giving me hope we transform more of the lackluster packaged food currently offered. Thank heavens! The current ones, which are barely a step above what would find at a fast food restaurant, have been an embarrassment from the start. 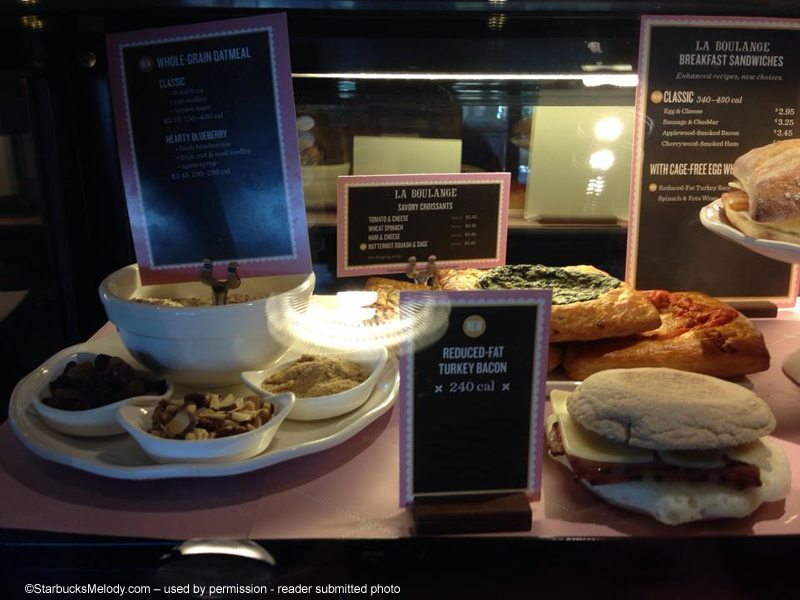 SBUX needs to offer real food with quality ingredients and…flavor! My favorite breakfast sandwich at Starbucks is the classic with the sausage, egg and cheese. I look forward to new options. That said, I would love to see some newer, higher-quality breakfast sandwiches! Bring ’em on, Starbucks! I LOVE the Proscuitto & Cotto! 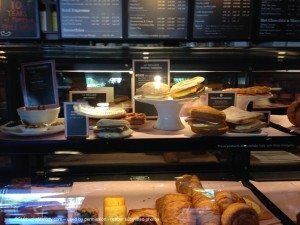 It’s by far the best Starbucks Breakfast sandwich yet. Most customers HATE the new Reduced-Fat Turkey Bacon. It’s a lot smaller than the old one and the customers think the new Turkey Bacon looks and tastes like Ham. The new Veggie is very flavoral and a lot more similar to the Spinach Feta Wrap, which we are still carrying. The Sausage seems like the exact same sandwich and there is much noticeable different with the Bacon and Ham. You can just tell they are just a little more “rustic” and better quality. To the person who said something about the Chicken Sausage wrap, I don’t believe that any La Boulange stores carry it. That was me. I said the Chicken Sausage wrap was my favorite and I know it was discontinued at the same time as the La Boulange debut. @Carol – I used to like the chicken sausage one too, but by the looks of the new breakfast sandwiches, I’d rather have those. I’m with Carl Black -the current lineup of sandwiches is not that great. @CamSpi – Have fun with the La Boulange launch! One unsung gem in the La Boulange lineup is the walnut, coconut, chocolate chip cookie – you’ll like it! @Tom D – I am so glad you weighed in! I want to try the new Proscuitto and Cotto sandwich now! @Melody, I wish we had that cookie! It must either be a test item or a regional offering. I couldn’t eat it due to allergies, but my customers would like another option. My personal favorite is the summer berry croissant and morning bun. If these make it nationally, I’ll give them a try. Like Diele, I found the muffins to be chewy, so stopped buying them. I am most interested in the prosciutto, as I love it in baguette sandwiches. @Melody ”Not that great” Is it me or I’m the only one here that really enjoy Starbucks Breakfast Sandwiches?! Yesterday was about 30 orders for Breakfast sandwiches, in about 20 minutes. I find the current Breakfast Sandwiches to have the best taste,flavor,hot,tasty and consistent(hence why they look to be more of an ”evolution” rather than a complete change which is a good thing). McDonald’s and Panera are just too inconsistent(especially their bacon, and heat of the sandwich). Starbucks have just relaunched their breakfast offerings in the UK with a big promotion. Personally I never eat breakfast out of the house as it is too expensive and too calorific. These do look good however. While I do enjoy the Spinach Feta wrap occasionally I find it to be cardboard tasting at times. I look forward to some new options! I’ve probably gotten their breakfast sandwiches less than a handful of times in the last decade. That number would be much, much higher, if the sandwiches were actually hot, soft, moist, fresh, & NOT cold, hard or stale. Also, if there was more variety & better choices, better recipes, & more flavor. I actually prefer certain fast food breakfast sandwiches over Starbucks’ any day. It would be nice to customize your breakfast sandwich (e.g. no pork, extra cheese, add ketchup), like you can your drinks (but, of course, that would go into restaurant-y territory). Improved breakfast sandwiches… I just hope it’s not too little, too late. When they “revamped” the regular sandwiches/paninis, I was hoping they’d introduce a nice tuna sandwich on sourdough w/ all the fixings & condiments on the side. I’ve heard of tuna sandwiches being offered in other parts of the country, but I’ve never seen them in the Bay Area. I’m seeing a lot of changes in regards of food offerings, but I’m not sure it’s all in the right direction. Fixed tucsonian. 🙂 Thank you! On November 12th, we are getting ketchup(free of charge) and a tomato pesto sauce($.50 a packet). Very excited to try these on things to spice up the flavor! @ Diele – Ketchup! I want to see what the ketchup looks like when you get it in! Interesting. The tomato pesto makes some sense too. Be interesting to see how it goes. The Artisan Veggie has changed. It’s now similar to the Spinach Feta Wrap. It’s called the Veggie and Fontiago. It is on a whole wheat Ciabatta with Sundried Tomatoes, Spinach, Carmelized Onions, Egg Whites, and Fontiago cheese (similar to a white cheddar). It’s a great sandwich! 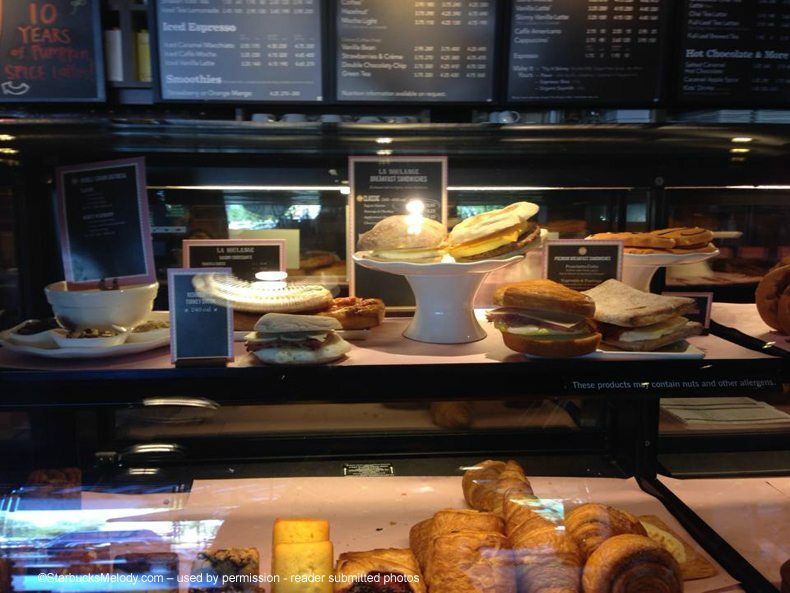 My heart breaks for the lack of options someone like me has for breakfast at Starbucks. Could we get some gluten-free and dairy-free choices for those with allergies? This issue that you bring up Ilene G is one that I always wonder about because in general I feel SB does not pay as much attention to customers with specific allergies or the vegan/vegetarian customer. Given the size of the company, it surprises me. I know they have tried to offer options for this customer group, but have not been successful. While I am not a vegan or allergic– I have certainly encountered many customers who are. With such specific needs of each person, I think from a corporate standpoint it is impossible to mass produce something tasteful and which will be a profitable margin– remember we have to think bigger picture, not just your neighborhood or the 1 or 2 Starbucks locations you frequent. I think the best resort is to use the Starbucks suggestion website or simply write corporate offices explaining your preferences and needs; until you see changes. If the need is really as you say, I’m sure marketing and development will investigate. Remember the old adage the squeaky wheel gets the oil. I just found a location that offers the Proscuitto & Cotto in Fountain Hills, AZ and it was awesome. Although, I do enjoy the current lineup, so I hope they add rather than replace. Overall, I LOVE the La Boulange introduction to Starbucks. I ordered my usual turkey bacon sandwich this morning and when I opened it wasn’t the same. I questioned my server and was told it was new. If it’s not broke, don’t fix it. I did not like the new sandwich and I won’t be getting it ever again. I loved the old sandwich and would eat it for breakfast, lunch or dinner. I will have to go back to my veggie egg option and hope you don’t change that as well. According to my local store, the artisan veggie sandwich is not available anymore as it is now and a new version will be arriving soon. I have not been able to get it for about a week or so. @Purple1 @Chrissy – I know that there is an overhaul of breakfast sandwiches coming. I thought the official launch of that was March 4th with other spring items, but I’ve some comments on a few sites – it looks like in some places they’ve already switched to the new breakfast sandwich. I’ll have to double check my own stores. It will be a blog post soon enough. Well, I feel somewhat silly to share this, but I really love the present ham, egg and cheese sandwich. I do not eat fast food at all and am a pretty picky food person; these are not “fast food-ish” to me. Maybe our stores in SoCal go through a lot of sandwiches so ours are nice and fresh all the time? I do like a little crunch to my top roll, so that does not bother me in the least. I sure hope my yummy little sandwich does not get discontinued! There is not much other “food” to eat for a vegetarian at Starbucks, so I eat a lot of the spinach feta wraps. I have not yet tried the new savory squares. It sounds like the new sandwiches should be here next week. Will there be a new seasonal latte as well? @IzzyJ – It feels to me like A LOT is coming to Starbucks on March 4th. So much so that I’m not sure totally what I’ll write about. As I recall hearing, there’s a new Vanilla Macchiatto. There are new teas. There are new breakfast sandwiches. Tribute Blend. And one more new coffee which I’ve known about for a while but haven’t talked about yet. Tuesday will be huge. Just found out today that my favorite turkey bacon & reduced fat cheddar sandwich is gone at my local Starbucks. Those sandwiches were delicious for lunch and breakfast. It’s been replaced by an egg white and ham (no cheese) sandwich that is about 1/3 smaller. Not big enough for breakfast — and not very interesting or tasty — so I’m giving up on Starbucks breakfasts. I agree: If it ain’t broke, don’t fix it! A couple of people have posted on My Starbucks Idea that there is a new Turkey Bacon breakfast sandwich, but that it isn’t as good. I had the new veggie sandwich this morning and hated it. Why make a change when it was delicious before. The new one is very dried out eggs and messy vegetables on a grainy bread thing. I’m very disappointed. The new veggie sandwich is 470 CALORIES!?! The ham and swiss is 490 CALORIES?!? What are they thinking? When they took away the veggie artisan I thought at least when the new veggie arrived it would be comparable but that’s a ridiculous amount of calories. Looks like it’s back to the turkey bacon – and here’s hoping the new one is edible. I totally agree that the new sandwiches are high in calories and fat! The new veggie cheese sandwich is 17 grams of fat! Even though it has 5 grams of fiber. SB be a bit more healthy with your new sandwiches. I might get one now and then but certainly not as often as I did the veggie artisan. @Purple1 – I really need to get an article up about the new breakfast sandwiches. That’s one of my next things to write about. I’d love to hear how people like them. I tried the new veggie one yesterday and thought it was delish, but very, very filling! Melody the new veggie sandwich was good once they got the oven set properly and that was only because the partners realized it needed to be reheated. This morning I asked a partner if they finally got it right and she said that SB sent them the wrong info about heating up the new sandwiches and they were waiting for the correct info. Really? How strange in my opinion. So, as far as I know right now my local store is just winging it re heating the sandwiches. Purple1: who was told that corporate sent the wrong info about heating the sandwiches? Prior to starting serving them, the stores were sent cards to reprogram our ovens so that we could accurately heat them. The only problem would be if a store was sent the wrong card.